Note 1: 'Barfi!' has been copied in the title of this post. 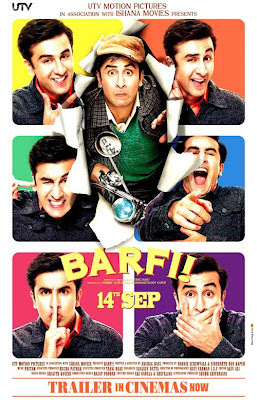 Note 2: Note 1: 'Barfi!' has been copied in the title of this post. I had a truly amazing cinematic experience when I watched 'Barfi!' last week. My facebook feed was filled with updates hailing the movie of the sheer brilliance and the joy this movie is. News came, 'Barfi!' is now officially this year's entry to the Oscars from India. Within a few days, the tides turned. People were now sharing clips of movies from which 'Barfi!' has been copied. Like this, this and this. People seem saddened and disappointed. Something they connected to, felt proud of, brought them joy, only to later discover that it is a copy! Oh, the blasphemy! Let's talk movies now, let's talk Oscars, let's talk about the disappointment, let's talk about our country now. Let's talk some sense. First, 'Barfi!' is India's official entry to the Oscars this year (The complete year-wise list is available here). It has NOT already been nominated to the Oscars (and chances are, it won't be). There is going to be a ballot, first round of shortlisting, the list ultimately cut down to 5 movies, which will compete against one another for the Oscar for the 'Best Foreign Language Film 2012'. Let's talk Oscars now. The Oscars are NOT an international awards. They are NOT the United Nations of movies. They are an American awards institution. To understand which movies will/will not win at the Oscars, we need to try to understand it from an American social-cultural point-of-view. It is difficult for us to understand that, because we are not Americans. It is for this reason that we find it so difficult to understand why 'Slumdog Millionaire' won 8 Oscars. Of course, Hollywood ships amongst the best movies in the world, so Oscars definitely is a good indicator of the quality of movies that win them. There is truly great cinema out there in the world which do not find any mention at the awards. Does that make those movies bad? All dogs are animals, but all animals are not dogs. Do we need a stamp of approval from a body that is NOT Indian to make us appreciate what good cinema is, and what is not? We lack a good governing body for cinema awards in India. Of course there are the lack-luster National Awards, which is a pretty good indicator of good cinema in our country. Filmfare Awards could have been the Oscars of our country, but that is a lost cause now. 'India's entry to the Oscars', irrespective of how the movie performs at the Oscars itself, is a good recognition for a movie, because it is picked by an Indian governing body. Let's talk movies now, and the "originality" of the great movies. Directors refer to old classics all the time. They sometimes acknowledge it, they sometimes don't. The iconic opening text crawl in 'Star Wars' (winning multiple Oscars across the 6 movies) was directly "inspired" from Flash Gordon TV Series. The classic 'The Lion King' (1994) (4 Oscar nominations) "heavily borrows" from 'Kimba: The White Lion' as analysed here. 'The Shining' (1980) has an iconic scene which has Jack Nicholson breaking his way through a door. It has been "inspired" from this scene in 'The Phantom Carriage' (1921). The steps scene from 'The Untouchables' (1987) (nominated for 4 Oscars, winning 1) was inspired by this scene from 'Battleship Potemkin' (1925). Tarantino's 'Reservoir Dogs' was "ripped-off" from 'City on Fire'. ...and then there are remakes. Kurosawa's 'Seven Samurai' (1954) nominated for 2 Oscars, remade as, 'The Magnificent Seven' (1960) nominated for 1 Oscar. 'Män som hatar kvinnor' (2009), remade as, 'The Girl with the Dragon Tattoo' (2011), nominated for 5 Oscars, winning 1. 'La cage aux folles' (1978) nominated for 3 Oscars, remade as, 'The Birdcage' (1996), nominated for 1 Oscar. 'Infernal Affairs' (2002), remade by Martin Scorcese as 'The Departed' (2006), nominated for 5 Oscars, winning 4 Oscars. 'La bonne année' (1973), remade as, 'Happy New Year', nominated for 1 Oscar. 'Profumo di donna' (1974), nominated for 2 Oscars, remade starring Al Pacino as 'Scent of a woman' (1992), nominated for 4 Oscars, winning 1. I do not deny that 'Barfi!' has references to several great classics. Maybe even a scene-by-scene copy. But from classics! 'Singin' in the rain', 'City Lights', 'Life is beautiful' are AMAZING movies! Among the best I have ever watched! 'City Lights' is my most favorite movie in the romantic genre. That's the point! The director did not "copy" from the obscure movies, he did from the classics, which is why I am willing to give the film-makers the benefit of doubt. This would have been "caught". But does that make 'Barfi!' anything less than being good cinema? An emphatic NO. Few scenes are copied, yes, but the heart of the movie is true, original, and fresh. I am a little disappointed, yes, but not to the extent of stupidity. What is wrong with our country?! We went into the theater to watch good cinema. We experienced joy and happiness, we experienced good cinema. That feeling was real. Cherish it. The fact that we discovered a few scenes in a movie were "copied" from great cinema around the world, does that make anything we felt inside the theater any less real? Why is it suddenly a matter of national shame and disappointment? Cinema is a big deal for me. I like to talk about it. I love the experience it can offer. I speak to a lot of people around the world, and try to understand what their cinema is, and I tell them about the great cinema my country has to offer. 'Barfi!' is a movie about which I am going to tell people around the world. With pride, that my country produced this gem in film-making. I am going to share this with the world. And I know they would appreciate it. And so should you. Note 1: Go watch it. Note 2: Go watch it again. Like I am going to. I love love-stories. Stories of love that are pure at heart, and charming, and innocent. Stories of love that fill your heart with such warmth, that you come out after watching a movie and start seeing the world in a slightly different light than before. There are very few such stories made for the screen. The kind of love I am talking about here is when two people are in love, and they can just be together. I am talking about effortless love. Putting that on screen is no mean feat. Such movies which really impacted me are few - 'Wall·E', 'Up', 'Once', 'Pan's Labyrinth'. 2 animated, 1 Spanish, 1 Irish. I loved 'Amélie', but I felt it fell a little short of something, I don't know what. Which also brings me to Hindi movies. I want to watch Hindi movies, because Hindi movies can affect me at a deeper level than a movie in any other language ever can. I long to watch Hindi movies because of where I come from, because it can be closer to who I am, because of the natural connect and the feeling of belonging it can offer. I love it when love is expressed not in words. It's just expressed, with such truth and honesty that you begin to experience it yourself. 'Wall·E' had almost no dialogues for a good part of the movie, which made it so much more romantic. 'Barfi!' belongs to that rare class of movies that go there. What a masterpiece Anurag Basu has delivered! Each frame is a painting on the celluloid canvas, crafted with such love, and passion for making good cinema. The colors are magnificent. The setting is apt. The iconography is spot-on. The detailing is extensive. The cinematography is beautiful. The scenes stick with you. They have put a lot of thought into little things. Little things, such that the whole is greater than the sum of its parts. The director has kept everything subtle. Nothing is in-your-face. It respects your intelligence. It assumes "We don't need to explicitly explain it to our audiences, they will get it." This is not something Indian film-makers are accustomed to. Considering the subject, not once does it get preachy, and still manages to get a very strong idea across. I was concerned that Ranbir Kapoor's antics in the first half-n-hour of the movie would go stale as the movie progresses, and oh boy did they prove that wrong! The director manages to delight, amuse, and surprise in such clever ways, that you are left wanting for more. I long for movies made in our country that exploit the huge opportunity India's diversity presents (think 'Gangs of Wasseypur'). It felt like I was transported straight into a Ruskin Bond story. The fractured narrative is done masterfully, without it seeming forced or confusing at any point in time. It enhanced the story-telling so much more. The writing is intact in the second half. Such a satisfying watch! It's difficult not to get a lump in your throat as the movie ends. Such a teary-eyed happy feeling. Good times for Indian cinema. The performances are rock-solid. I did not like Ranbir Kapoor earlier. Not that I have seen many of his movies, and I loved it when he was slapped so hard in 'Raajneeti'. I watched 'Rocket Singh: Salesman of the Year' and kind-of liked his performance. But oh my 'Barfi!'. This is the movie he was waiting for, for people to take him a lot more seriously. And Priyanka Chopra just stuns! She has disappointed in so many duds that I had written her off. But this! The preparation and the effort she has made to get every expression right, such control over body language, to get every twitch perfectly, shows. Her screen-presence is poetry. She easily tops Rani Mukherjee in 'Black', and I am hopeful that she is picking up a National Award for this performance. And then there are other gems like Saurabh Shukla's performance. Such brilliance in an otherwise minor character. This movie is a triumph for Indian cinema. Such movies get made maybe once or twice in a decade (which is such a shame). My prediction is that this movie is getting a permanent spot on the imdb top 250 movies list, that is considering the current rating and the pace at which this is gaining in the ratings, and the number of votes. My hope is that this is getting an Indian ticket to the Oscars. With a little trimming, to get the running time under 120 minutes. Considering that the theme is universal, and language isn't a real impediment in getting the movie, it can gain some serious traction in the film-circuit and be a real contender at the Awards. I so want to see that! Damn!